Fanless industrial PCs are excelent in environments dominated by dust, dirt and moisture. They are ideal for applications that require quiet operation. Small and reliable MiniPC use of heat-pipe technology and aluminum fans for passive cooling.MiniPC Nuc IBOX-501 N3 is a series of devices for industrial applications requiring continuous operation - 24 hours, 7 days a week. Integrated card - Intel RTL811E 1000M Lan and WiFi+Bluetooth module allows connection to the network. The computer is equipped with: two LAN ports, one VGA port, one HDMI port, one USB 3.0 ports, five USB 2.0 ports, one COM(RS232) port and a built-in connector on the motherboard: SATA port, MiniSATA port, one RJ-45 COM and one Mini-PCIE connector. The industrial fanless MiniPC Nuc IBOX-501 N3 uses a special method of cooling. This cooling takes place mainly by means of housing having a very large surface (longitudinal lamells, ribs) - for heat dissipation. 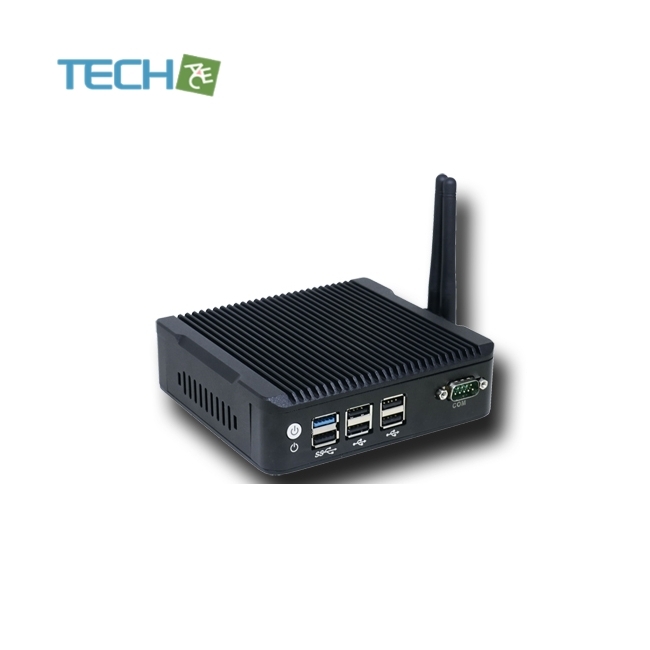 Industrial MiniPC Nuc IBOX-501 N3 are based on high-performance quad-core processors and high-quality components. Mini computers are locked in small industrial housing which perfectly discharge heat from the device interior. Wide choice of IBOX models can give possibility to configure, enabling optimal selection of mini computer to multimedia applications and industrial applications. The biggest advantages Industrial Computer Fanless MiniPC Nuc IBOX-501 N3 of these devices are: small size, performance and energy efficiency. An extra pair of brackets at the bottom of the enclosure increases the possibility of installation in all kinds of places and positions. Offered model mini PC has been selectively chosen and configured specifically to the requirements of Digital Signage systems, gaming machines, amusement machines, information kiosks and industrial automation systems. 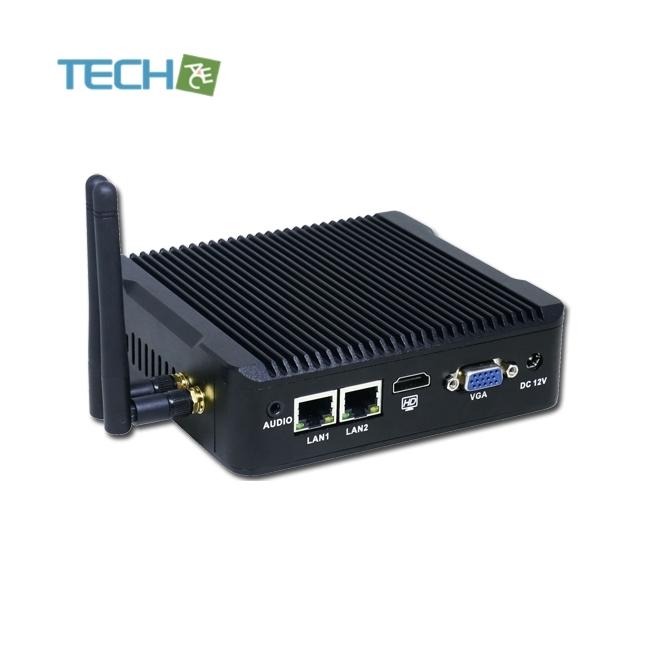 Industrial fanless MiniPC Nuc IBOX-501 N3 by USB ports can be used to connect multiple devices in the store or warehouse and make them easier to control. Its durable housing is perfectly designed for the harsh conditions prevailing in these areas. Any dust or dirt does not impede him in his work, will work without any problems even in high concentrations of dust and in polluted environments. MiniPC Nuc IBOX-501 N3 can be used on transport market, in cars, through adapting him to operate with a supply 12V. Mini computer can be used in cars, buses, trams, taxis, trains, and even airplanes. Thanks to its functions is suitable for all vehicles in which the restriction is a small space to mount additional hardware.